Session musicians: Angel-0, J, Mist, GR. 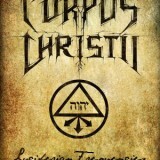 With the main aims of spreading the Word of Satan and to raise Torment over this Earth, Corpus Christii has been releasing works of audio terror since 1998. 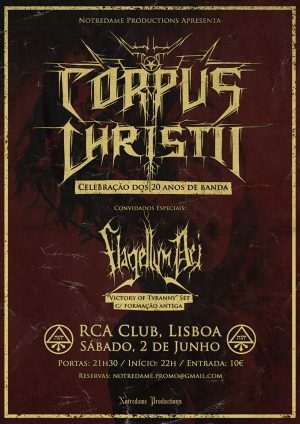 Being the first Portuguese band to expand internationally in a more broad way than they had been done before, Corpus Christii have reached out to a vastly spread audience on all continents through their releases but also through numerous live-gigs over Europe. The back-catalogue consists of 12 releases in various formats (tape, CD, vinyl) of which 5 are full-length albums. The band has passed through different Eras in the creations, the first one being the more primitive side with “Saeculum Domini”. Thereafter going into a more technical state with “The Fire God” and most recently, the conceptual “Torment”-trilogy where dynamics and built in symbolisms reflect themselves throughout the lyrics as well as the music.